This truckie is now $200k richer. A POINT Cook truck driver is happily celebrating his $200,000 Lucky Lotteries win after discovering news he initially thought was a prank, was actually true. The Victorian man won the guaranteed first prize in Lucky Lotteries Mega Jackpot draw 1262, drawn Monday, April 1, 2019. When a Tatts official called the truck driver yesterday, he admitted he initially thought the phone call was an April Fool's Day prank. "I didn't answer your call because I thought you'd just be a scammer," he said. "My wife rang me and said we received an email about winning the lottery, but because it's April Fool's Day, we thought it must have been a prank. "But knowing it's real, well that's just awesome! Thank you! It's one of those things you never think will happen to you. "This is massive for us! It will change our lives." When asked how he planned to spend his prize, the hardworking man said it would make life more enjoyable. "Honestly, I need time to really think about what I am going to do with it. Tonight I'll sit down with my wife and we can plan how best to use it. "We've never had this much money before so we might go on a holiday I think! "We've travelled quite a bit, been on lots of big adventures, so we would love to go somewhere to just relax. We will go somewhere beautiful, warm and near the sea. "I work a lot every week, about 70 hours, so this will help me slow down a bit. "I am already thinking about not going to work tomorrow and having a day off to really celebrate the win! Does that come with a prize? A day of leave?" The thrilled winner, who wishes to remain anonymous, purchased his entry of two random numbers online at thelott.com - Australia's official lotteries. 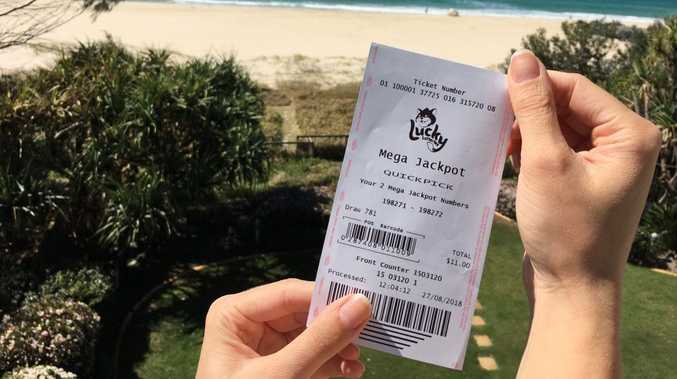 The Lucky Lotteries Mega Jackpot prize is now $52.12 million for draw 1264 while the Lucky Lotteries Super Jackpot is now $4.53 million for draw 10281.